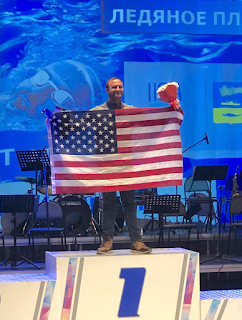 With the water at 0.2°C, the hardened veterans came from 32 countries, ready to demonstrate their skills and talents in the near freezing water. The well-known luminaries from Petar Stoychev and Alisa Fatum to the Mäkinen sisters from Finland and the young Polish speeders like Hanna Bakuniak, Aleksandra Bednarek and Michał Perl all showed up and won races. But the 36-year-old newcomer Quinn Fitzgerald proved that the cold is a condition that evidently suits him well [see video above in lane 8]. He finished fifth overall in the 200m freestyle event as his first cold water swim of his life and then upset Michał Perl, German Tobias Jakle and Russian Pavel Bainov ain the 50m freestyle. He ended up swimming less than 2 tenths of a second from a world sprint title. Fitzgerald is the first Yale graduate to win a world swimming championship title since Don Schollander in 1964. Note: the previous reported results of the men's 50m freestyle were inaccurate. The above results are confirmed as official.